Extensive selection of GRC case studies. Vital information about microstructure and mechanisms. Glassfibre reinforced concrete (GRC) is the most complex material widely used in current construction practice. It is an unusual composite, in which both the matrix and the reinforcement themselves are composites. This new book on GRC, recently sponsored by the GRCA, provides guidance on the properties, its specification, testing and the latest methods for efficient production. Detailed information is presented about the unique aspects of the internal structure and fracture mechanisms of GRC and how the latest advances in nanotechnology are leading towards a fuller understanding of the rational design of GRC and the potential for further improvement of properties beyond those used in contemporary construction practice. GRC has been always a very versatile material; however, its range of practical applications has grown significantly. From small, simple items (flowerpots, drainage channels, window sills, etc.) to large-scale, high-tech iconic projects from leading architects, where GRC has to cope with the highest demands regarding structural complexity, freedom of shape, striking appearance combined with durability and overall quality and excellent environmental performance. The composite is well used in the reconstruction of complex historic facades and GRC has moved beyond construction into the domain of art and interior decorations and furniture. The case studies show numerous examples of such designs and products, including recently developed large double-curved panels with unusual surfaces and strong colours, and selfcleaning and photocatalytic (air-cleaning) e-GRC. Introduction and scope; Brief history of development; Constituent materials; Manufacture; Composite action; Properties of fresh and hardened GRC; Structural design; Specification and compliance; Health and safety; Summary of benefits; Applications (Mature structures, Civic buildings, Office and commercial buildings, Residential buildings and developments, Religious structures, Art and recreation, Reconstruction/conservation of historic and contemporary buildings, Interior decoration and furniture, Architectural building components, Civil and environmental engineering); Standards; References; Appendices (Calibration of GRC spray equipment, Determination of glass content of uncured GRC, Determination of flexural properties of GRC, Determination of dry and wet bulk density, water absorption and apparent porosity of GRC); Index. 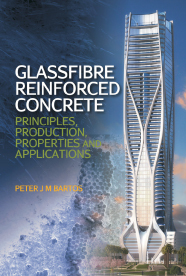 Professor Peter Bartos has been involved with Glassfibre Reinforced Concrete (GRC/GFRC) and The International Glassfibre Reinforced Concrete Association (GRCA) from its earliest beginnings up to the latest developments.